A single-screen platform brawler thats about as good as the genre has ever beenin versus or wave-survival mode. Gamers aren't the only ones who blame lag. 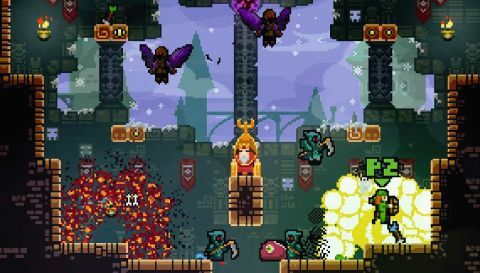 Indie devs cite it for the current abundance of local-multiplayer-only platformers, of which TowerFall Ascension represents an exquisite pinnacle. Up to four players can plug in pads and then plug each other with arrows, darting around numerous screen wrapped 2D arenas. Its versus mode alone marks the high tide for single screen deathmatch, but the true delight is its brutal two-player wave survival campaign, a thing of rare, beautiful balance and jubilant chaos. Which is to say it makes a pretty good case for the unique joys of lagless offline gaming, permitting pixel-precise inputs calculated in the slimmest slivers of a single second, for which no clever server-side prediction could compensate. This is a game of deftly deployed shortrange evasions: side-steps beneath cover, mid-air dashes and chained wall-jumps that send your character pinballing through the environment. A player might drop from the top of the screen, loose an arrow through a narrow alignment of architecture, catch an incoming missile mid-air, and then dart off to the left, wrapping round the screen to take a shot from the other side. The only thing that slows the pace to anything near comprehensible is your arsenal: you begin with only three arrows. Once fired, you'll need to retrieve them from the people in which they are now buried. If you miss your target, you effectively gift your opponent a free shot. If you miss three, you're boned, making attacks less speculative and duels deliciously tense. Your weaponry is remarkable in another regard: arrows home in. That this should be the case in a game otherwise about the precise, lagless matching of player input is curious—and curiouser still is the fact that it never once feels like a cheat or a concession for the control scheme's flaws. I don't know what Dark Gods were invoked to effect this miracle, but I fear them. A more immediate quality is the terrific invention of the game's pixel art animations, best demonstrated by the co-op campaign's varied bestiary. Kill a cowled foe and the cloth crumples to the ground, empty. Skewer him to a wall and the gown hangs there like a pendant. Punctured eye-bats plunge from the sky with arrows still protruding, gargoyles are engulfed in flame, and blob monsters squelch apart. Each enemy's expiry is as idiosyncratic as the tactics they employ: some lunge at you, some reliably deflect your first shot, some burrow through walls. As more spawn, your actions become a flurry of evasions and attacks, a juggle of perfectly weighted variables, as exhilarating as it is unforgiving. TowerFall's campaign mode can be played solo, but it doesn't go easy, and it's no cakewalk with two players. But its pacey escalation of enemies, power-ups, and arrow types compels a "one-more-go" ascent through its stages, each offering a slightly different challenge, a new rhythm to the action. The game being so multiplayer focused and entirely offline, however, the opportunities to play TowerFall properly are limited. Arguments about lag are moot if you just don't often have four friends around to play it. I'm not even good enough to take real tactical advantage of the low latency—decaying synapses are my bottleneck. But I can still feel that crisp, tactile, instant response. It feels good. It feels right. When a game is this precisely considered, so exactly tuned in every part, then forget the convenient compromises of netcode—play it how it wants to be played. You owe it that.